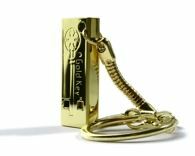 Roger E. Billings, Chairman and CEO of GoldKey Security Corporation, announced the launch of the GoldKey security token. The device was developed to help organizations protect sensitive data on local computers, removable storage devices, and remote servers. The technology is targeted at financial institutions, the military, and others seeking a more robust method of dual authentication to protect critical information systems. GoldKey provides multi-factor authentication and strong AES 256-bit encryption as a secure alternative to conventional public key technology.